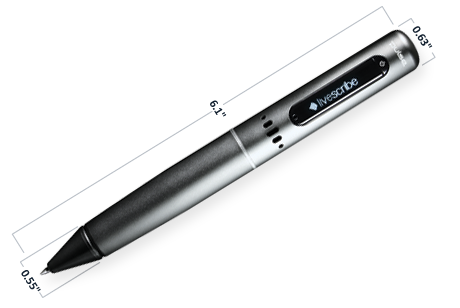 I have just tested the LiveScribe SmartPen and might be in love. This pen is a digital audio recorder and camera built into a large ballpoint pen. It timestamps every note I take using the special spiral-bound notebook with almost imperceptible dot-matrixed paper. After I finish taking notes, i click the pen on the part of the image or text and the audio recorder plays back whatever was being recorded at that time. Now, if they can just come out with a 4' x 8' whiteboard version with multiple colors and a portable Aeron chair with lumbar support, I'd be set! Morning Edition, April 21, 2008 · A California company has invented a new pen. It features a camera mounted on the nib and a microphone that records audio, along with a docking cradle that allows uploads to a computer. But some note-takers still prefer quiet, old-fashioned pens and paper. I love my pulse pen but have lots to figure out about it(also have to remember to hit the record button at times -- yikes!). 1. Record "3D Audio" using the Pulse. 2. Open using QuickTime Pro. 3. Export as WAV or AIFF. For my purposes I'm probably going to download a converter to change the aac file directly to MP3 and then pull it into Audacity play with the background noise and levels. But first I just want to figure out a good organizational system for my sound files. Target will be selling the pen next month so supplies are going to be more accessible. I see there is now a journal format available. I wrote and suggested 5x7 notepads for quick notes -- the big notebook is so clunky.